Beginning with the question of ” Who is in your nature family?” Who do you look forward to coming home to and tending to at night or visiting on the weekend, or thinking about when you are separated? Draw your family including your nature family members. This was one of the activities offered to teachers at a recent workshop run by HumaNature Connect (on behalf of the Nursery and Garden Industry Victoria) that helped to structure lessons and discussions with students that would improve young people’s sense of ‘who nature is in their life’ and the idea of kindness and respect as it relates to nature. These lessons and discussions were based on activities in the Respectful Relationships Curriculum. The discussion had, highlighted that there is still a stigma around this topic of nature connection with people being labelled as ‘hippies’ and ‘ off with the fairies’ by their colleagues for using the language of emotions and intimacy that characterise connection with nature. One teacher said that a colleague asked her ” Why would you go to a workshop on nature connection?” as tho it was the most unimportant topic she could imagine. Nature connection is a buzz word in curriculum and in main stream language yet we have a long way to go in helping not just children but adults as well understand what the concept of ‘connection’ really means and to feel comfortable in speaking about emotions. We wouldn’t talk about our friendships with people as ‘human services’ but we talk about ‘environmental services’ as tho our only relationship with nature is a mechanical transaction. The only widely accepted exception is when talking about our pets who have cute faces and a strong sense of perceived aliveness, thus making it easier to feel empathy for them. What if we could bring to life all parts of nature, the clouds, the rocks, the plants. To do this we need to spend time tapping into the less obvious signs of life that we can only feel or notice when we take time to be with different part of nature. Cloud gazing, ripple making, mimicking plants growing, finding rock friends and just being with and feeling into (to help with this look for the book The other way to listen by Byrd Baylor). We also need to put ourselves in natures shoes and ask ” What would nature say to you for that act of kindness you have shown it?” “Would nature agree with your idea or plan to improve its health? These are questions and experiences not only for our young people but ourselves as adults. Have a go…see if you can draw a stick picture of your nature family? (Could be the bird on the balcony, the plants in your house, the worms in your worm farm, the special tree you always sit under when you are on holiday, your dog). See if you can find the words for the emotions that you feel for them (there may be many both good an challenging) and write them next to your drawing. What would your nature family to say to you for your acts of kindness? Write your self a thank you card from your nature family. 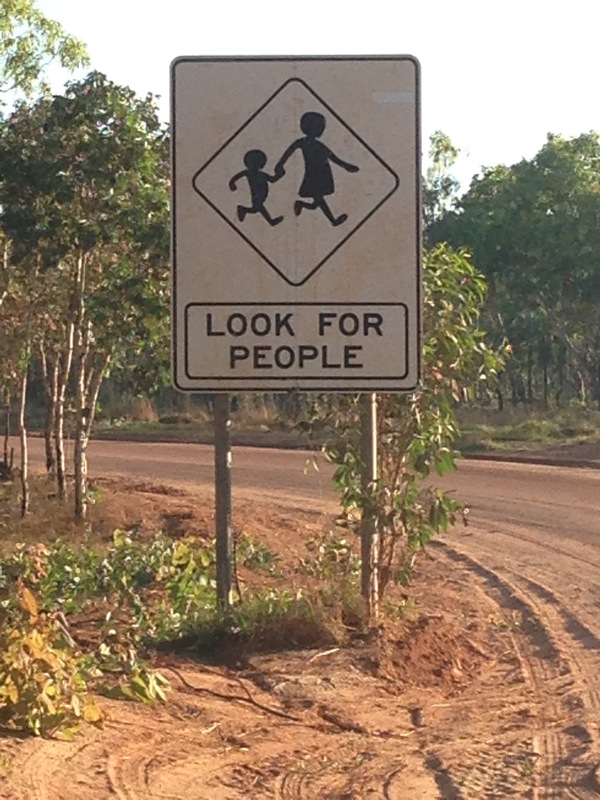 Part 1: ‘Look for people’-This is a road sign you see out around remote communities in the NT. People are part of the landscape even tho you might drive a long way and think no one is there. Other ‘signs’ are the countless fires and rock paintings. 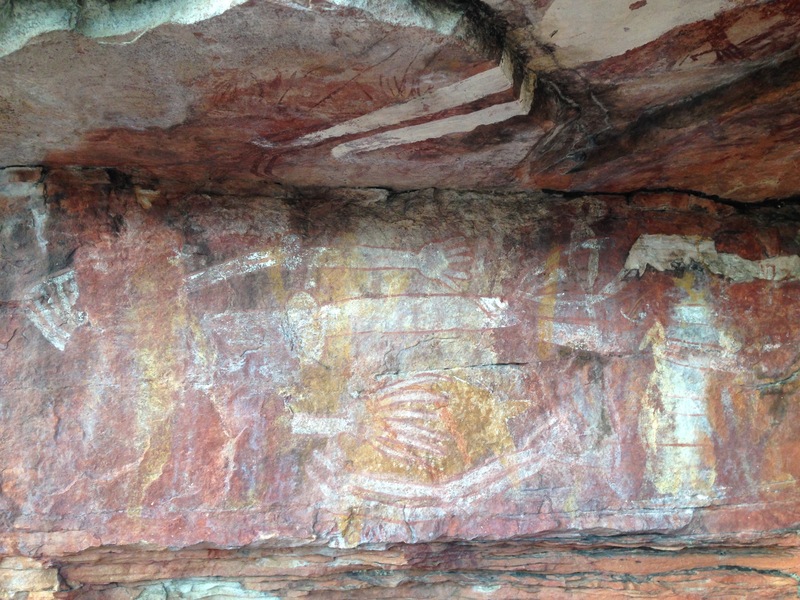 At Litchfield Creek recently the absolute plethora of rock art is staggering. It is layered and some is very old; I guess that makes it more important right? Wait a minute, people are doing what they have always done here and that is communicate meaningful information or stories through images, why am I questioning worthiness, just because people now are still doing this practice? This mindset i.e. my western lens of conservation risks rendering Aboriginal culture static! Part 2: On this Litchfield Creek walk, there is no path, its a make your own way kind of route. I was wandering out from the conga line of bushwalkers and another participant asked with judgement “why are you walking up there?” To which I replied that I was just finding my own way and exploring. We seem to accept the rights of Aboriginal people to be living and roam on land but what about the rest of us who are also indigenous to the earth? 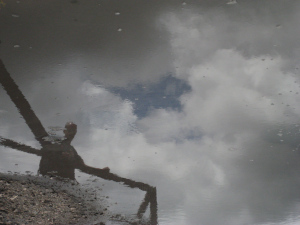 Is our western lens of conservation of the ‘out there’, rendering our own culture in relationship to nature as static?! 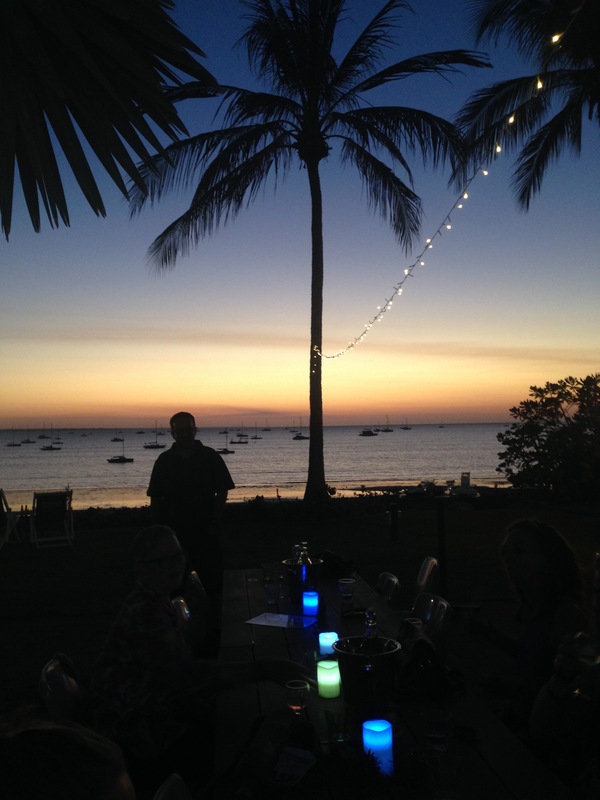 Part 3: People here in Darwin ‘city’ are also gathering and sharing experiences of nature. You cant go 5 minutes in conversation without someone saying ominously “oh you wait til the build up” . The paper also has a section dedicated to crocodile reports, houses are open and people are out at every opportunity it would seem all along the coast. Why wouldn’t you have your work xmas in July when you have views like this (photo left). This kind of human-nature interaction is celebrated by western culture; is that because it is ‘in here’ confined by concrete paths and cities? If we are going to re-build the human-nature connection as is now considered to be of critical importance, how do we balance a conservation mindset with the idea of allowing people to be in and interact with their natural habitat ‘out there’ as well as ‘in here’. How do we determine what footprints are worthy? Connection to nature has a utilitarian side! I have been learning first hand about this from those who understand nature connection better than most, the Aboriginal community in the Northern Territory. I take older Aboriginal ladies out bush for a week for women’s business and respite. These ladies hunt turtles for food and to see this makes me and many other’s from our culture uncomfortable. A case in point: I was swimming in the beautiful Mataranka Springs at the end of one of my working camps and I saw a group of Aboriginal people walking around the path carrying the usual zip up supermarket fridge bag full of fishing gear. At the same time I saw some tourists squeeling with delight over seeing some turtles in the absolutely crystal clear waters of this hot spring. As the Aboriginal group approached them, the tourists enthusiastically pointed out the turtles and I thought to myself ” no don’t do that!” I knew what was going to happen next. Sure enough one of the ladies quickly pulled out her line with its big hook and bait and tossed it in, much to the absolute horror of the tourist onlookers who shouted ” No don’t kill it” . I walked past just in time to see this unsuspecting turtle take its fatal bite and in the hope of diffusing what could have become an emotional confrontation, I said to the tourists, “this is food, this is their way, just walk on”. No doubt I feel challenged every time one of the Aboriginal ladies on my camps catches one of these beautiful creatures; they get just as excited about seeing kangaroos and fr ogs as I do, but they see food, I see a cute creature that I want to protect. I guess it makes me think that connection to nature is not just the ‘la la’ feeling of the warm sun on your skin, the chirping birds but perhaps its about respect more than anything; a respect of co-dependence, which for us is lost in our supermarket ready life and our lens of what’s is acceptable to kill and consume. Fishing is socially acceptable to us because fish are generally not considered cute and what’s worst? farming millions of cows, sheep and chicken for over consumption or catching a turtle for yourself and family. For Aboriginal people living in Northern Territory, connection to nature is still rooted in survival for us we are shielded by supermarket packaging, over consumption and our socially accepted lenses of what animals we should care about (its ok to eat fish but not dog). Perhaps in our efforts to re-connect with nature we can add mindful shopping to our ‘to do list’ and revisit our concept of what is enough when it comes to the volumes of food we catch, farm and consume. I think my lesson is that connection to nature has an uncomfortable side and this is where the real personal work needs to happen to fully understand what belonging to the natural world is all about. 1. The acceptance and condoning of violence against nature. 2. The lack of opportunity for nature to contribute to decision making in public and private life. 4. The lack of equal and respectful relationships between men and women and nature. 3. Recognise the nature around us and accept its intrinsic value and right to exist regardless of wether its pristine rainforest or the median strip on our street. Respectful relationship education is about to begin in schools across the country with Victoria leading the way. It is compulsory for all schools to take a whole school approach to the prevention of violence against women through through this program. In order to fully understand respect for someone else and to develop a healthy relationship with other people, we must have respect and a healthy relationship with ourself too. I wonder if the impact of this program will flow on to also create respect and a healthy relationship with nature ? If it does then we have the trifector that could lead to a dramatic increase in community wellbeing. I wonder what we can do to help schools make this link?! Just a thought…. The answer is yes, if your environmental sustainability projects or daily actions increase health and wellbeing of all of nature including yourself. If that is not the case, then maybe its time to inject a bit more heart into what you are doing and how you are being. Think about any interaction with nature that left a positive impression on you, it may have been simply hearing the birds this morning. What would you need to do to create more of that -more hearing, more birds. Is there a step that you can take today to make that happen? We are living in hope filled times! In the City of Hume in Melbourne, there is a palpable excitement in organisations business and local government about bringing nature back into our lives. Why now ? why there ? For change to happen there must be personal will and passion combined with structures and opportunities that enable people to act. The Healthy Together Victoria initiative has been just that. Its an excellent example of a systems approach that supports hopes, dreams and community leadership by supporting workplaces and schools to become health promoting settings under the guidance of human centered design thinking. These settings design healthy eating, physical activity, mental health , alcohol and smoking initiatives that effect change across policy, culture, community work and internal opportunities for staff. Low and behold, its nature connection that has been the most popular choice of strategy to address these broader health and wellbeing issues; nature connection in the form of community gardens and orchards mostly, but also outside walking groups and environmental work. This is despite the fact that it is not listed as a benchmark activity for addressing any of the broader health and wellbeing issues in the framework. People seem to know intuitively that they need to interact with nature, feel it nourshing their bodies in the form of home grown organic food, do some activity to care for it feeling a sense of purpose and doing physical activity in the process; they just needed the official excuse to do it and promote it on work time. Isn’t it time that nature connection found its way formally into practice frameworks as its own priority area or own benchmark ? After all it is essential in its own right for health and wellbeing. Whether we like it or not its these frameworks that society values and institutions respond to. This is a major step forward in creating culture change where people start to consciously recognise the importance of nature in their health and wellbeing and a step toward combined environmental and health policy. For this to be truly holistic however, a large gap still remains, an important one. That is to explicitly address spiritual and cultural aspects of the human-nature relationship; to build pride and identity, gratitude and a sense of responsibility; a notion of stewardship and belonging with nature. This is the realm of nature focused arts based projects, mindfulness and celebration, the intrinsic stuff that words don’t explain well. The challenge is to find the words that do fit and find the opportunity to get these words into frameworks and policies. This can and will be done, its only a matter of time. Note on the author: Erica is researching ways in which organisations are enabling culture change by integrating nature connection into policy and practice; with a particular interest in emotional/spiritual connections with nature. It is commonly accepted that human beings experience three layers of experience body, mind and spirit. Body relates to the way our physical self interacts with the surroundings; mind relates our thoughts and intellect but what is spirit and what does it have to do with sustainability?